MMSD has to assure appropriate work conditions for operational command unit’s crews on field. 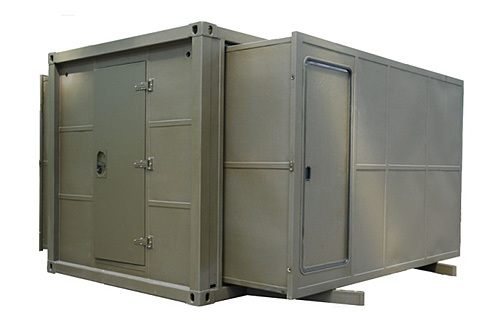 MMSD bases on the KR-15/5-MMSD cabin and allows to install 10 or 12 operational desks – depending on version. Each workplace is equipped with three independent 230V AC power supply outlets connected to UPS, four phone communication outlets, LAN/WAN socket and VoIP. 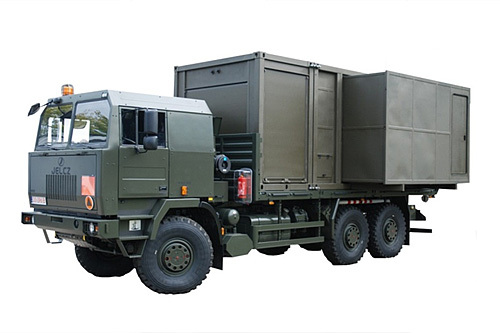 Moreover, the MMSD shelter contains lighted panel, all-in-one printer, 55″ display, UPS, map handlers, weapon stand, air conditioning, filter and ventilation unit, OPL alarm device, external board with optical and phone connectors, ladder and automatic cabin’s side modules extension system. The technical part of the MMSD contains two automatic power generators which analyze properties of generators and electrical network. The automatic opening of module takes less than 100 seconds. The KR-15/5 is preapred for transport by land or sea.